Being born in the 50s but raised during the 60s, it’s almost a given my musical roots would look to Elvis, The Beatles, and Rock ‘n Roll in general for that rebellious streak to represent the time growing up in that era. And that’d be true. Still, no matter what you’d boast to your friends, the music of those who raised you would always be an influence. Such was the case with my grandmother and Andy Williams. My mom’s mother was first-generation Mexican-American and spoke little English. A young widow, born right after the century turned, she didn’t have the easiest of lives. With an equally young son of that first marriage in tow before she ever laid eyes on another widower (one with his own daughter from his first union), she’d meet and marry (for the last time) my future granddad back in the hard scramble of Texas. And, they beget another six children (one of them being my mother) to add to their brood before pulling up stakes and making their way to California during the late 40s. By the time I was four, I’d be in mi abuelita‘s sphere of influence until her passing in 1981. Being raised in my grandmother’s home was seemingly like sleeping in Grand Central Station at times, what with all the comings and goings by family members (most of which were her now grown children) in her house. Even so, it was through the conduit of her television set there in the living room where much of the popular arts, that became part of me, would enter my life. Of course, when she’d sit down we’d only watch what she choose. Even though she stood just under five foot, you didn’t mess with this woman. Believe me. And she never missed an episode of The Andy Williams Show. Man, did she love Andy Williams. I often wondered how much English she really knew and just never let on (out of stubbornness or habit) while she sat there, gaze glued to that variety show. She’d put up with my Spanglish, mostly because I was her chosen grandchild (and admittedly my Ma was long known to play favorites), but I can count on one hand the number of times I heard her utter a phrase in English growing up. 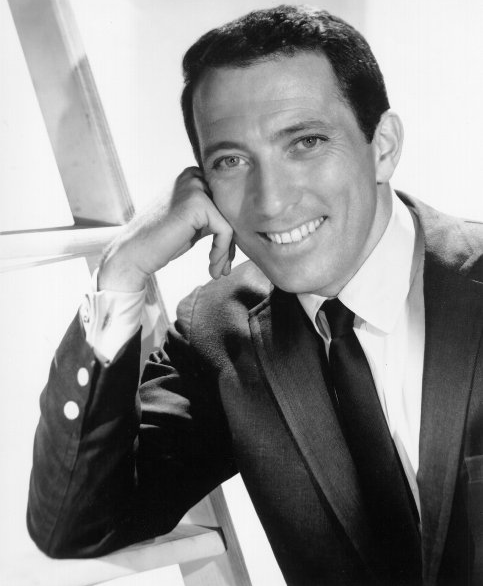 Despite that, Howard Andrew “Andy” Williams, too, was easily her best-loved American singer. She just adored his voice, and probably his looks, likewise. A crooner in the best sense, the Iowan with the silky voice was, as Allmusic put it, “Easily the most solid and long-lasting vocalist of his era.” He could give any song a wonderfully smooth rendition, or reinterpretation, that would do his church choir upbringing proud. His vocal timbre remained so distinct, even decades later, and was instantly recognizable by anyone who’d ever heard him on radio or television. It didn’t take much imagination or shrewdness on my part to see why my grandmother was so enamored with this songster. Given all this, I couldn’t help but be impacted musically by Andy Williams growing up. As part of his career, he carved out a unique niche, beyond the popular songs at the height of his career, “his soft-toned cover of the Charlie Gracie rockabilly nugget “Butterfly” hit number one (it’s still his biggest hit)“, to make quite a name for himself with the Christmas holiday. You cannot get through that season without someone (or some establishment), somewhere playing his version of It’s the Most Wonderful Time of the Year. It’s just not possible, folks. How very true. Andy made it stirring beyond words. The length and breath of his discography is nothing short of staggering in volume and form. The first song of his I ever downloaded (decades later) happened to be the same first pop song that hooked me to Mr. Williams on AM hit radio of the day. I Can’t Get Use to Losing You, “a 1963 record release, which was a #2 hit in both the US and the UK.” I still play it to this day from time-to-time. Andy Williams’ end means something deep inside this listener. A chronicler touched by song. Something tied to my upbringing and family, and all by way of my grandmother. Caused simply by what she tuned that old set to way back when, how it registered in her make-up, in the crazy manner of TV osmosis, and how she passed it on to her nieto. May they both rest in peace. Great post Michael. Like I said to Ruth earlier. People are surprised when I say I’m a big Andy Williams fan. I have been for years and like you say his abundance of songs is staggering. He’ll be sadly missed. Thank you, Mark. I’m not surprised this singer would have an international following. So sad to hear of his passing. And then there was ‘A Time for Us,’ the love theme from the Zeffirelli film, Romeo & Juliet. But my favorite is ‘Almost There,’ a tune he sang in the rather obscure film, I’d Rather Be Rich, which co-starred Sandra Dee, Robert Goulet, and Maurice Chevalier. Interesting, 3 male singers in this film but only Williams actually got to sing. Lovely tribute!! There are really sooo many great songs that were made even better because he sang them. Oh how could I forget ‘A Summer Place’ that was a wonderful song, I don’t know how many CDs of Andy Williams we had around the house, but for sure there were many 🙂 Glad we have another thing in common Michael! It’s simply great that we share an appreciation like this one for a singer who quietly enriched our lives. Many, many thanks, Ruth. Andy Williams was the first concert I ever went to (I was with my parents). Your grandmother reminds me of my grandmother. 4′ 11″ and don’t mess with her. She was Italian though. His songs are like a piece of a dream-like past. It’s blurry but lovely. Thank you Michael. That’s a great memory, Paula. And yes, grandmothers like ours were women you loved and respected. Thank you very much those thoughts. Christmas doesn’t start until I hear “It’s the Most Wonderful Time of the Year” sung by Andy Williams. It is the most classic Christmas song ever to be recorded and it reminds me of snow and candy and toys and twinkle lights even if I hear it in July. Same here! So many of his yuletide songs dominate our holiday music listening in my household. Thank you very much, Marianne. Fantastic post and tribute to Williams. I love how you always take your personal experiences and link them with song or a movie. It’s fantastic. You’re most generous, Fernando. And it’s very much appreciated, my friend. Many thanks.